It's easy to recognize the problem of violence in the Old Testament. One simply has to point to the many divine commands to commit genocide, and it is immediately obvious that this portrait of God conflicts with the God revealed in Jesus. However, I want to propose something radical: The real problem with violence in the Bible is not the Old, but the New Testament. That's not where I began, but it is where I ended up. Like most people I initially began by wrestling with violence in the Old Testament. This is the place most people begin, because it is where it is most noticeable. However, as I really began to dig into the issue of divine-sanctioned violence in the Bible, what I found was that the place that is the most problematic for us today is actually the New Testament. To understand why I say this, consider the typical way an argument will go between two Christians. One is arguing for divine-sanctioned violence, and another is arguing against it. The argument for divine-sanctioned violence will either be that God violently punishes by killing or torturing people (in the eternal torment of hell), or that we humans (in the role of the state) have a divine mandate to violently punish by killing or torturing people. For example, conservative Evangelical Christians have been some of the most outspoken advocates for the death penalty, war, and, government torture. So when I say "punish by killing or torturing people" that is quite literal. All of this is presented as for the good of us all, as an example of the way of a good God who is both loving and at the same time stern. The Christian advocating for this "good violence" may begin by citing the Old Testament. This will then get the response, "Well, that's the Old Testament... that's the Old Covenant... that's not Jesus"
The basic argument here is that the New Testament trumps the Old. Christians across the board, both conservative and progressive, will basically recognize this as valid. If someone is going to quote from the Old Testament, it needs to be shown that this is in line with Jesus and the New Testament. It is at this point that our Christian violence advocate will then pull out the ace in his sleeve, countering with a verse from the New Testament which allegedly shows God being violent or purportedly shows Jesus or Paul advocating for human violence in God's name. For example, they might quote Paul's seeming endorsement of state lethal violence in God's name "Rulers do not bear the sword for no reason. They are God’s servants, agents of wrath to bring punishment on the wrongdoer" (Romans 13:14), arguing that for this reason we should also have the death penalty today. "What?" We exclaim, "It says that?" Yup, and the New Testament also says a lot of stuff about God killing and torturing people, too -- torturing them forever and ever in hell. This is not just in Revelations, but the very words of Jesus (particularly in Matthew's Gospel). This is when the jaws drop, because our common assumption is that the Old Testament is violent, while the New Testament is focused on peace and love. Yet Christians, who argue for an angry punishing God, and who likewise argue that our government should model that same violence "for our good," will make their arguments using the New Testament. My point is not that there is not a problem of divine-sanctioned violence in the Old Testament. There certainly is a huge problem. However, for us as Christians, at the end of the day what really matters is how we read the New Testament, because this will determine how we read the Old Testament as well, and whether we embrace and mirror a violent punishing God, or mirror the God revealed in Christ. 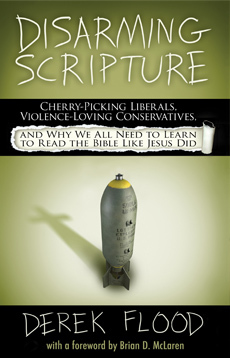 So if we want to chart out the way of Jesus characterized by enemy love, it is not enough to simply say "look to Jesus" or "read Christocentrically" or "read the Bible like Jesus" because those who advocate for God's violence and for our violence in God's name claim that they are following Jesus and the New Testament, too. So if we really want to move away from violence in God's name, the place where we really need to focus is the New Testament. 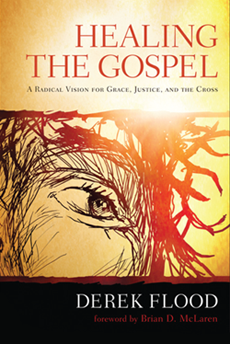 We need to expose the wrong ways that people read it in order to continue to justify violence as good, and we need to seek to really understand the way of grace, forgiveness, and enemy love that Jesus proclaims, so that we can practically apply it in our own lives, as well as to the larger societal and political issues of our day. This is the task for us as the church. This is what spiritual formation, what discipleship looks like. This is how we are to have our minds renewed so that we will take on the image of Christ. Do not be conformed to the world, but be transformed by the renewing of your mind. With that in mind, next time we'll take a look at one of the key New Testament texts that is used to justify state violence in God's name today by American Christians: Romans 13. Thanks for your work on this issue. I can't express how valuable it has been for me, and, I hope, one day, for the larger society. I'm eager to read part 2. The real problem isn't with the old testament or the new testament. The real issue is reading the Bible like Jesus did, like you propose. Romans 13 has no power that the Spirit cannot overcome on our mutual trinitarian journey to the infallible Jesus...the way you have been leading people into. I believe in the work you are doing. Believe me on this one. The fruits of the kingdom are spreading. Christendome is falling and the power of our homeless-carpenter is rising in His mystical body, the Church...God bless you Professor. BTW: You probably already know this, but the Anabaptists would say that Romans 12 is an ironic chapter to precede the infamous Romans 13 chapter on the state. But more than that, the grace preachers (ones found in the likes of Joshua Tongol/Jay Bakker and and even Tullian Tchividjian/Preston Sprinkle/Steve Brown) are extremely important in the future movings of the Spirit ahead for the lay people, the same ones that your writing style is so accessible to. My only question is who are the female grace preachers? Know of any good ones? I think you're making a good point, but would also add that we need to uncover the original meaning of the various Greek terms translated into the English "hell." From my understanding, Jesus' view is not mainly the afterlife, but rather warning people not to make a total mess of their lives in the here-and-now. This explanation also seems to erase much of our pre-conceived notions of God torturing dead people in a supposed "hell." Thoughts? That's a good point. I'll try to dig into that more as I continue this series. Does Rachel Held Evans count as a grace preacher? She's kind of awesome. I agree with you about hell. My point is not that the NT condones violence. I think that is actaully a misreading. What I am saying is that -- misreading or not -- Christians who do endorse and legitimize violence (God's and ours) look to the NT to justify this. That's why we need to learn to read it like you are proposing, which is the direction I'm going to steer the boat in this series. Hi Derek, thanks for your comment. After re-reading your post, I see your point, that lots of well-meaning Christians unfortunately misread Jesus & Paul as promoting divine violence. We definitely need more scholars to tackle these faulty interpretations head-on! I guess Rachel Held Evans would be a grace preacher. I don't know, I think I might have a mythical ideal stuck in my head about what a grace preacher says or does. I guess I was thinking of Joshua Tongol or Tullian Tchividjian, but they are just different kinds of grace preachers, and Rachel Held Evans is another type....I don't know. Thanks anyways. You are definitely right on with the Romans 13 chapter being the single force through which violence is upheld in the church; Romans 13 and Revelations 19 as well. But Romans 13 is definitely the stronger argument. I know John Calvin used the heck out of Romans 13 in his disputation of the Schleitheim Confession. But Just War Theorists are just lazy now days. If just war theorists actually looked at the tenets of Just War including: (#1) Proportionality (Jus Ad Bellum) - The proportionality of the use of force in a war. The degree of allowable force must be measured against the force required to correct the Just cause and limited by Just intention. (#2) Discrimination - the combatants discriminate between combatants and noncombatants. Innocent, non-military people should NEVER be made the targets of attack....Then no Christian should be in favor of the atomic bombings of Hiroshima and Nagasaki. I would actually say that EVERY Christian should have protested the attacks and saught healing and repentance as a nation. So all in all, great post(s). You are amazingly gifted logician and theologian, and I am always learning from you on how you give such mature and non-judgmental answers. I (and the whole world) am definitely in process on that skill. I think we're totally on the same page here. Something I do think is worth mentioning is that I think there is an improper reliance on "scholars." The bottom line issue here is a moral reading, and scholars do not by trade have the corner on that. It's kind of like doctors and bedside manner: Just as there are lots of doctors who have wonderful bedside manner, there are likewise lots of biblical scholars who do a great job with an ethical focus to reading Scripture, but in both cases it is by no means a given that just because someone knows history or Coptic that that not anything about reading morally as a disciple of Jesus. So just as we need to find ways to help doctors interact in sensitive ways with patients around the trauma of illness, so to scholars need to be taught how to read ethically. I'm sure you are very much aware of this yourself, but just thought I'd throw it out there. What I notice is that--in broad strokes--women like RHE tend to foster conversations rather than doing the talking themselves like...ahem...we guys tend to do. So in that sense, that kind of listening, facilitating of dialog, and so on may not seem like "preaching" in the sense of one person who talks from a pulpit while the rest of listen, but actually I think it's really great to foster dialog, and especially to allow those who are often not able to speak to be given a voice. So it spurs me to re-define what "preaching" can look like. Good insights regarding just war theory. One thing that makes it functionally untenable is that it assumes that certain moral criteria are being weighed to determine whether war is justified. However, this is something an individual soldier would never do. They are trained to simply obey orders without question. The only possible players who would make such moral deliberations are commanding officers, generals and the government. The reality here is that these folks are, as a rule not making those choices based on anything remotely connected to Just War criteria at all, but instead think in terms of "collateral damage" and what not. So Just War theory becomes exactly that: a theory that is simply never applied in the sense of restraining anything at all. Walter Wink has suggested that instead of thinking when it is "just" to kill, it would be better to instead think of how we can reduce killing. He calls that "Violence Reduction Criteria." "Yup, and the New Testament also says a lot of stuff about God killing and torturing people, too--torturing them forever and ever in hell. This is not just in Revelations, but the very words of Jesus (particularly in Matthew's Gospel)." Derek, when Jesus says things you disagree with, do you claim that Jesus never said it, that Jesus said it because he knew that's what his audience believed (although he personally did not), or that he said it because he was a fallible human who thought that what he was saying was true? I've been asking these questions when it comes to Jesus' endorsement of portions of the law (Matthew 15:1-9). I think all of the things you mentioned come into play in one way or another (well, the first two do anyway. I don't think I could go with the last one). I spend a whole chapter on this in Disarming Scripture, dealing with Matthew's portrayal of Jesus in his Gospel and how this connects with the apocalyptic genre. It's an important topic and I feel a short answer here would not really do it justice, which is why I spent 20 pages or so on it in my book. Derek, thanks for responding. I agree that the last one is harder to go with but we know that Jesus was fallible as a human and admitted he didn't know everything. But I can see how questioning each of his statements to determine whether it was something Jesus learned from his father in heaven or something he learned from the humans in his life (that could be incorrect) opens up quite a pandora's box. I'm glad to hear you addressed the first two possibilities in your book. I do plan to read it. I think I misread your 3rd statement. I was thinking you were saying God was wrong (some folks have this idea that God develops in the Bible going from immature to mature. Jack Miles takes this view. I don't go with that. However, that's not at all what you said! You were talking about Jesus. I'm open to that idea, although honestly it is hard for me. For example the story of Jesus calling a woman a dog, and then repenting after she one-ups him is right there in the Gospels, but it's hard for me to admit that Jesus needed to repent and grow and apologize -- yet it seems that the Gospel writer is okay with this idea. That's really challenging stuff! I appreciate it, but it frankly makes me uncomfortable. With Jesus' violent sayings, most are in Matthew, and I think that's pretty significant. It means that Matthew is adding his "flavor" to the Jesus story, and that flavor in one that likes violent imagery. Other Gospel writers present Jesus much less violently. So we have diversity within the NT here, and within the disciples understanding of Jesus. As far as "questioning each of his statements to determine whether it was something Jesus learned from his father in heaven or something he learned from the humans in his life" is similar to the historical-Jesus question of what are the "authentic" sayings of Jesus. I instead take an ethical approach and simply ask: is what Jesus is saying here good? That is, I don't ask who is saying it (Matthew or Jesus) or it authenticity (historical Jesus or Gospel writer's addition), but rather I look at the merit of what is being said and evaluate it based on that. Is this good? Again, I go into a lot more detail of this method in Disarming Scripture. If I'm not mistaken, Jack Miles is talking about the development of the "character" Yahweh. But I think Walter Brueggemann would say God is actually maturing and becoming better. That sounds about right. Where I disagree with both of them (Miles and Brueggemann) is that whether it's God as a literary character, or the moral character of God, both assume that the Bible as a whole presents a single unfolding narrative. I disagree. I would say that it instead is a collection of multiple conflicting visions of who God is which catalog how people's understanding changes and develops (via the process of dispute) over centuries. In other words, God does not change, our perception does. Some older views of God represent immature visions of who God is reflect valuing abusive power of ancient warrior kings. That's a very different understanding of greatness from what we see in Jesus. I own that insight largely to Brueggemann, and so I think it's ironic that he speaks of God as "a recovering violence addict" since this assumes that the Bible presents a single unfolding view of God, even though Brueggemann himself is the one pioneers the idea that Scripture is multi-vocal in the first place, i.e that it's not one book, but lots of books showing a "record of dispute."